Still getting adapters to work on the recent rayfact, and gearing up for the tests of the expensive one. In the meantime, there are some industrial Nikon lenses on ebay - several from the same seller at different prices. In some of the lens images the lens coating looks very deep blue so I wonder if any of these are for normal visible light transmission, 400 - 1000 nm or something else. I've looked at those industrial Nikon lenses as well and considered taking the plunge. The sellers grading system leaves a lot to be desired as the lenses for sale span a large range of pricing with a very unclear description of any issues with the lens. They routinely discount the lenses by up to 50% so if anyone does try one out make sure to either make a low offer or wait for the discount. I own at least 4 variations of the 120 Apo-Digitar Macro that I enjoy using for it's versatility and large image circle. All the 120mm f5.6 Apo-Digitar Macro's appear to be optimized for 1X but the optically identical v-mount 120 Makro-Symmar's can be purchased optimized for 0.33, 0.5, 0.75 and 1X. I own the 0.5X model and it is also a great lens however limited by its aperture. Interested to know how it works out and what your plan for adapting it is. These days I almost exclusively use the global electronic shutter for the PhaseOne. I don't use the electronic shutter feature from the new firmware however because there is no way to trigger it externally - only the touchscreen. But my PhaseOne dealer told me about Aerial mode - made for aerial photography - and it works quite well. The camera back is mounted on a hacked view camera, with a lot of custom adapters. My company has a machine shop and that really helps! Also because the electronic shutter only has 1 second shutter time with flash sync, it means I must photograph in a darkened studio. I achieve that with a curtain that surrounds the set up. Amusingly there is a company that makes curtains for that sole purpose - including a ceiling track. They are great. For high speed shots (liquid splashes etc) I do use a shutter. I have several lenses with the Rollei electronic shutter system - including the 120mm Apo Digitar. However it's shutter latency is pretty bad. So for really low latency I have a special Cognisys shutter. I have the 80mm f/2 Zeiss Topar - the rear element has to be only 26mm from the sensor for infinity focus. But my system can do that. Ditto with the Rayfact MJ90 - just got the adapters made and I will shoot with it this weekend. I will need to do more work for the Rayfact 2X-5X lens that is coming because it needs a lot of extension - at 5X it must be 600 mm from the lens flange to the sensor. I have been thinking about making a smaller field portable version - I want to take the Topar outside. However, at the moment for location shooting I use the PhaseOne XF body and the built-in stacking feature with the 120mm f/4 SK blue ring lens. We've been running parallel on eBay- I watched the prices jump on the 80 f2 Topar's after the seller figured out they could be used with the 100MP global shutter. Did you figure out a way to trigger the Rollei shutter externally? I have 3 Rollei electronic shutters that I swap between my SK Apo-Digitars (35,90,120,150mm) and a Rodenstock Apo-Sironar Digital HR (60mm). I use the Rollei lens board system from an X-act camera (which is interchangeable with Novoflex adapters). It looks like Alpa just licensed the X-act2 camera system as their new view camera is made by combining parts from a Rollei X-act2 and a Novoflex bellows. It's quite a frankenstein camera for a company like Alpa. I also have a few Schneider electronic shutters and the hand controller and USB controller for the shutters. At one point I got the pin-outs and development specs from Ulrich Eilsberger before he retired. I ended up designing a cable that could trigger the shutter from Capture One using the hand controller. It's more reliable than the USB controller- I haven't really messed with the USB controller very much. That's what we did - we opened up the Rollei case and soldered extra wires to the shutter button. It still works normally, but we can trigger remotely. I am also making a set up to use the Cognisys high speed shutter for Copal 0 lenses. That would be great for high speed stuff. I have the SK apo digitars: 60mm f/4, 80mm f/4 (not the macro), and the 120mm macro. My biggest unmet lens goal has been to find a wide angle lens that will work well from macro distances to infinity. I have a cabinet full of lenses that I have tried to varying degrees of success. Some famous lenses that are fine at infinity are crap at 1:1 - for example the SK 35mm phaseone lens, or the Zeiss 40mm distagon (from Hasselblad). The best rectilinear so far is the 45mm Pentax 67 lens. There is a surprisingly good mamiya fisheye. I have wondered about the wide angle digital lenses from SK and Rodenstock which go down to 24mm, but there are several in the 35-55 mm lange that could work. Or maybe not... but they are kind of pricey to try for the hell of it. I have a Cambo WRS-1200 camera that came with a 35mm Apo-Digitar and a 23mm Rodenstock Digaron ($$$ lens). I ended up selling the 23mm Digaron to pay for other lenses but kind of regret it as it was amazingly sharp for a wide angle- I just don't shoot in the field often enough to keep such an expensive wide angle. 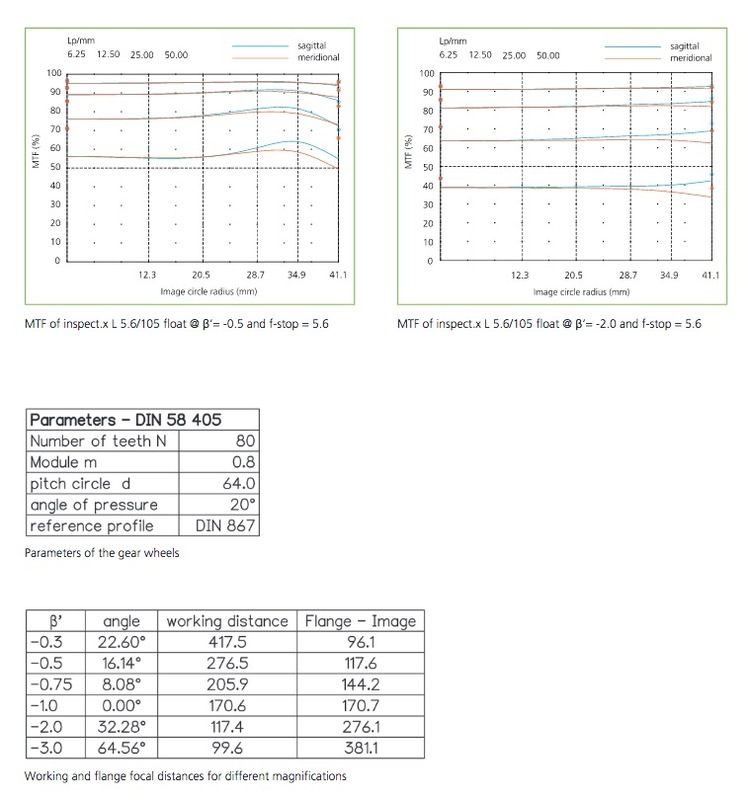 I would imagine the retrofocus Rodenstock wide angles would be the best bet for close focus to 1:1 given their MTF curves. I've gone so far to think about contracting out a custom WA lens optimized for close focus to 1:1. Group buy anyone??? Out of curiosity how big of an image circle do you need for your back? Also what is the sensor multiplication factor? The PhaseOne format is 53.7mm x 40.4mm so the diagonal is 67mm. 67mm is small for most medium format lenses, and of course for large format lenses. It's big compared to 35mm FF format which is 43mm image circle. The good news for larger formats is that line sensors made for industrial quality inspection are typically 82 mm. So newer lenses by Rayfact, Linos and SK are made with big enough image circles - typically 86 mm or even bigger. The SK macro varon was made for a generation earlier line sensors so it has a 62mm image circle, but in practice it is fine on PhaseOne: the quality does not suddenly degrade right at the edge. Of course whenever you use a lens at the high end of its magnification limit, you are making the image circle bigger (that's how magnification works) so it is never a problem there. The IQ150 has a 44x33 sensor (5um pixel & 50MP) and needs a minimum of a 55mm image circle. It is a 1.3 lens factor compared to the full frame digital 645 format. I can take full advantage of the ~60mm image circle lenses that were made for 70mm film duplication (vertical gate, non-IMAX films) like the printing-nikkor's and some of the earlier line-scan lenses like the MacroVaron. I can easily get ~100MP or more resolution with stitching. The image circle of the 120mm Apo-Digitar starts at 80mm for 0.25X and goes to 90mm for 0.5X and 110mm for 1X. As soon as I can afford it I'll move to the Phase One 100MP for the global digital shutter and increased resolution. I've been working my way up the MFD food chain over the last 10 years starting with a Phase One P20+ (17MP), a Leaf Credo40 (40MP) and now the Phase One IQ150 (50MP). Obviously medium format is a flexible concept. In the old film days the most prominent were 6 x 6 , 6 x 4.5, 6 x 7, 6 x 8, 6 by 9 and even for panoramic cameras 6 x 17 - all of these are notional dimensions in cm. I say notional because that is rounded size of the film used. The actual size of the image area varied a bit, 6x7 Pentax was (I think) 56 mm x 70mm. Medium format digital backs have lots of different sizes, and even one company like PhaseOne feels free to change a lot. One hopes that they have planned a head a bit and that the image circle of their current lenses will cover future cameras. Nathan, how are the results with the MVN after automating the CAS ring? Is it worth it? Are you doing deep stacks by moving the image sensor and correcting for the magnification change? Also, what magnification range are you using on the MVN when you automate the CAS ring? I'd be interested to see a deep stack that covered the range of 0.5-2X with and without CAS optimized. I find the 105 PN hard to beat at 1X - I also like the longer focal length. However the MVN is hard to beat when it comes to versatility. The coin imaging results prove how strong this lens is. Something I don't see mentioned about the MVN which can be a little annoying is the lack of ability to stop down. I like to stop down as much as possible when I'm using live to get a better preview of my subject and then open up to diffraction limited aperature when shooting. Useful for catching things like stray hairs and dust before you instigate your final capture. There is also the technique of stopping the lens way down for the last few exposures which you can't do on the MVN. I just wish there was a version of the MVN at 105mm or 120mm (rail lengths would be long at 2X but I can manage that). The closest thing I can find out there is the Rayfact MJ95mm from 0.5-1X. I'm very interested to know what the results are from the MJ90 - if it's a strong performer makes a good case for the MJ95. 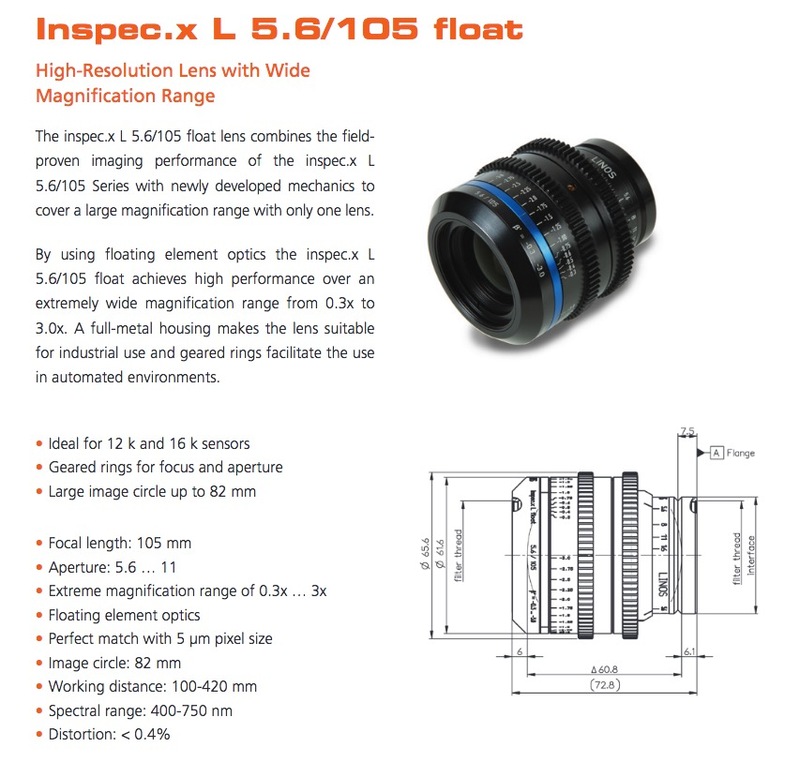 Don't forget about the inspec.x L 5.6/105 float. Last time I checked with Qioptiq, it was about $1K less than a new MV. All of my stacks (deep or shallow) with the MV lens have been with the automated beta ring, and by moving the sensor. Yes, it is worth it. The difference in the lens with the ring in the correct spot versus fixed is large. If I was shooting thin subjects - like the coins that Ray and others shoot - then I might not bother with either moving the sensor, or with changing mag. That said I don't know how accurate the beta ring has to be. But it was not hard to automate it with a gear and a stepper motor. I use Zaber linear stages and for software compatibility it was easiest to use a Zaber stepper motor and controller. I have done the whole range from 0.5X to 2X. Often a stack goes a little beyond and that is OK. I have sometimes done the whole range in a single stack. I am not sure why you can't stop down your MV. Mine has an aperture ring and you certainly can stop it down. I never have for a photo however. The Linos Inspec variable lens is f/5.6 which is kind of slow for a 2X using a sensor with 4.6 micron pixels (like I do), and worse with Canon or Nikon. The fixed mag Linos Inspec lens I bought on ebay came in and I will try post some photos. but it is 90mm focal length and f/4. It goes from 0.5X to 3X, but it is likely to run into diffraction at 3X. 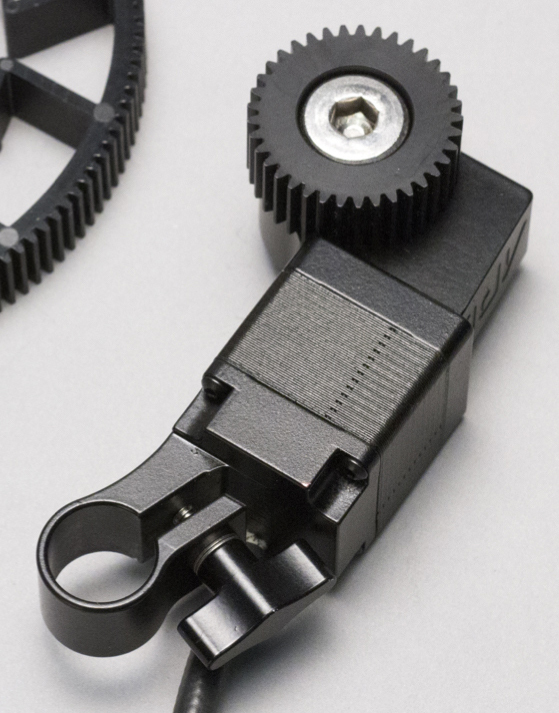 We designed custom Nema17 motors with worm gears for automating the focus on stop-motion films a few years ago. They mount on standard 15mm iris rods. I don't think the pitch is the same but perhaps I could adapt one- they are nice little units. I didn't mean to say I can't stop down my MVN - it's just that f8 doesn't give much of DOF preview of the final image. On a Apo-Digitar I'll stop down to f16 or f22 (or higher) to get look at the final image when I'm composing my image on the live view feed. I'll then open up to an optimized aperture to shoot the stack. Ah yes, I forgot about that inspec.x variable lens... Can't say I haven't looked for it though... Now if one would just come up on eBay I could give it a shot. The obvious drawback: f5.6 will limit it's higher magnification performance... I don't know how far beyond 1X I would go with it. Also, I have an unfounded aversion to Rodenstock - mostly because I'm not crazy about the color rendering of the Apo-Sironar Digitals and Digaron lenses... Probably unfounded for the Qioptic line. Interested to hear how the 3.5X inspec.x lens performs.